A couple of years ago, Lenny Zeltser wrote a diary entry on how to use curl to retrieve malware samples. If you don't want to disclose your public IP address when retrieving malware, you can use proxies. One way to do this, is to use the Tor anonimity network. On Linux and OSX, it's quite easy to do so. You install the tor and torsocks packages for your distro, start tor, and then launch your curl or wget command via torsocks. Mind you, the Tor network can be slow or unstable sometimes, which may interfere with the sample download. And Tor nodes might also be blocked in countries where you want to download samples from. On Windows, you can use Tor but not torsocks. For wget, it's a bit more complex, because wget can't talk to Socks directly. wget can talk to a HTTP/HTTPS proxy, so you can setup such a proxy between Tor and wget. 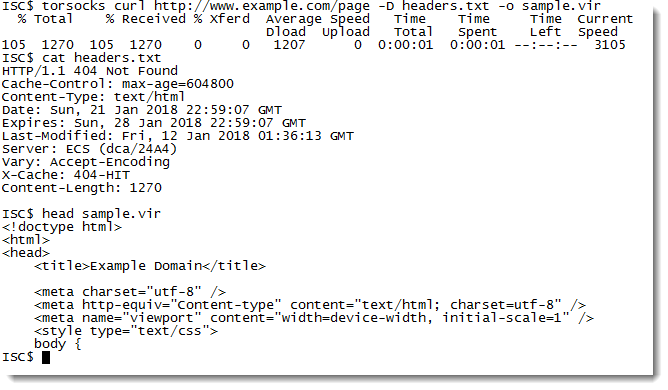 torsocks wget --max-redirect 100 --no-check-certificate -S -U 'Mozilla/5.0 (Windows NT 6.3; WOW64; Trident/7.0; rv:11.0) like Gecko' "$1"
torsocks wget --recursive --no-parent --no-check-certificate -R index.html* -S -U 'Mozilla/5.0 (Windows NT 6.3; WOW64; Trident/7.0; rv:11.0) like Gecko' "$1"
torsocks wget --max-redirect 100 --no-check-certificate -S -U "" "$1"
torsocks wget -S --referer="$1" -U 'Mozilla/5.0 (Windows NT 6.3; WOW64; Trident/7.0; rv:11.0) like Gecko' --header="Accept: text/xml,application/xml,application/xhtml+xml,text/html;q=0.9,text/plain;q=0.8,image/png,*/*;q=0.5" --header="Accept-Language: en-us,en;q=0.5" --header="Accept-Encoding: gzip,deflate" --header="Accept-Charset: ISO-8859-1,utf-8;q=0.7,*;q=0.7" --header="Keep-Alive: 300" "$2"